And what daily phone calls with Steve Jobs have to do with it. The Telephone Game (also called Chinese Whispers in English, or Stille Post in German) is a game that shows how easy a message can alter meaning if passed through just a few people. This is also true for company culture. The further away the message is from the sender, the higher the possibility it's not the same anymore. This is great! However, the more nodes are added to the message chain, the less control we have over how Jovo is perceived. The message and culture becomes a living organism. How do communities like Product Hunt manage to stay friendly and open, while there are so many Reddits and StackOverflows that become toxic after a while? I believe it's all about how well the initial values shine through the actions of the community. How can we make sure our values are passed in the right way even several degrees further away? Last week, I listened to a great podcast where Gimlet Media founder Alex Blumberg interviews Ron Johnson, the person behind the Apple Stores. It's a really fascinating conversation, where I especially liked the fact that Johnson had 30 minute phone calls with Steve Jobs every night for about a year. "The only way I can delegate to you Ron with confidence is if you can know exactly how I would think about an issue that you're trying to figure out on your own. And the only way you can know I think is if we're really close." At first, this seemed very odd to me, but after a while, it made a lot of sense. By really getting to know Steve Jobs, Ron Johnson was able to understand not only what decisions he made and how, but, most importantly, why he made certain decisions. "This is what Steve would think about this" is probably something Johnson was able to anticipate after a while, thanks to these phone calls. The challenge of building a community is to find the right ways to do this process of getting people to understand you, at scale. I always hated meaningless one-word values written at walls, and was mostly interested in setting an example. However, I can now understand people that care about this. Having something written down and mentioning it in daily life can sometimes be helpful. While writing this, I realized that I had started a book about exactly this topic, but somehow managed to not finish it. 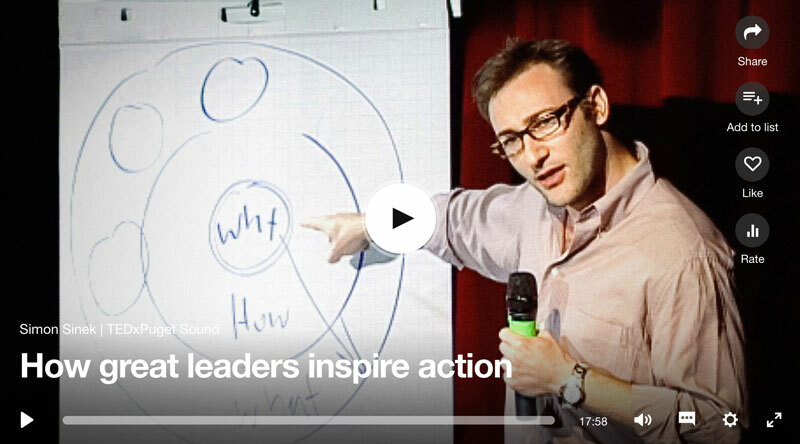 Time to open this one again: Simon Sinek - Start With Why. Do you have any examples of values that worked well for you or your company?